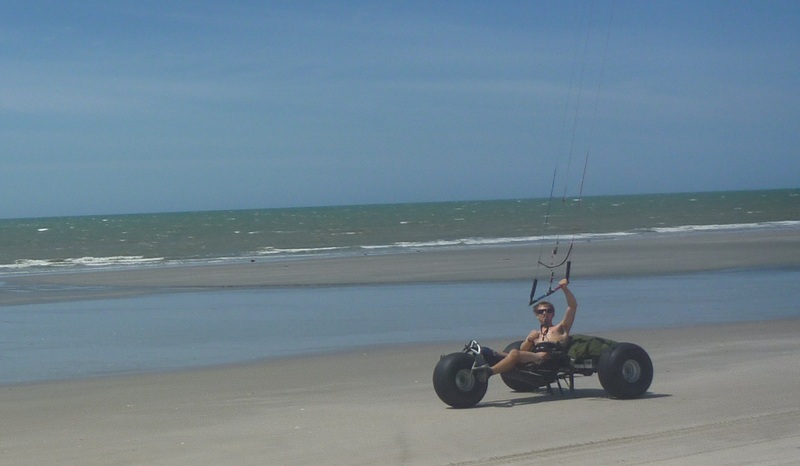 Travelling along in a kite buggy wearing nothing but a kite harness is an odd sensation. The breeze is very refreshing but this is counteracted by the fear of what might happen if you were to have an accident at such a speed! 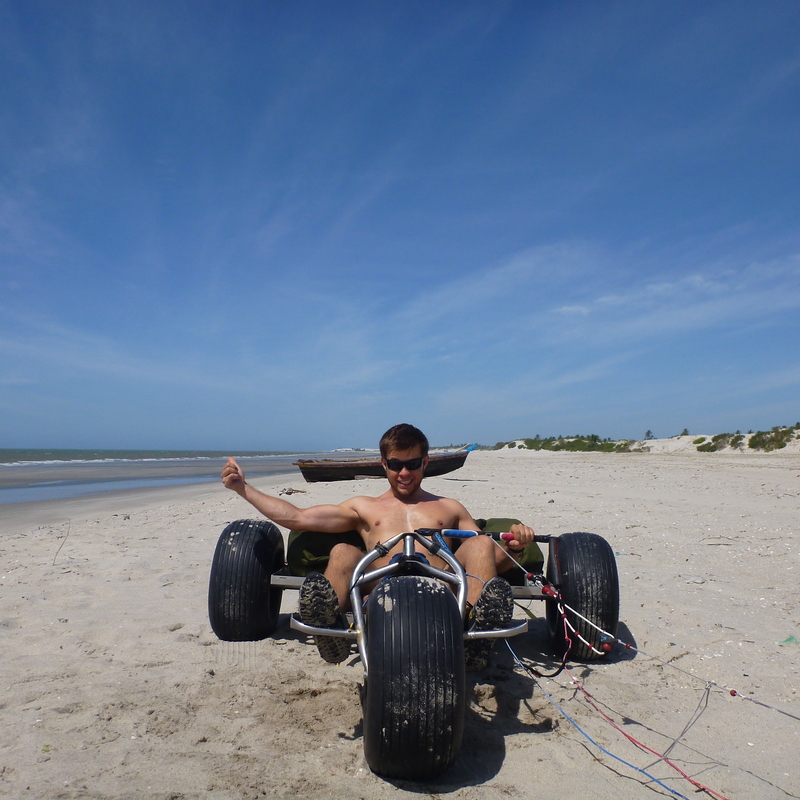 Leapfrogging the width of a beach – how hard can it be? Well if the sea is at low tide and you haven’t done a leap frog since you were seven, harder than you’d expect! 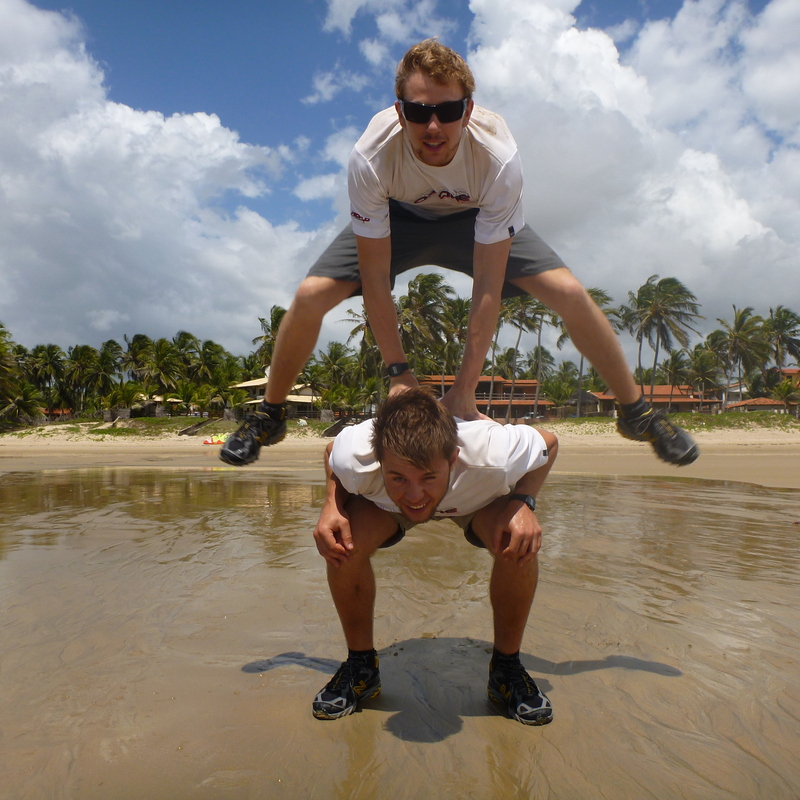 When we were in Baleia we remembered we’d accepted a challenge to leap frog the width of a beach in return for a donation to Centrepoint. So down to the beach we went with cameras in hand. One or two sweaty, sandy minutes later and we had successfully made it to the water’s edge – much to the amusement and bemusement of the locals. It’s the afternoon before we set off, and we’ve had some very good news! Firstly, Christchurch Harbour Hotel has generously decided to sponsor us on our journey. They have donated a large amount of money to Centrepoint to help us reach our target of £2000 for the charity. Harry and I have both worked there during school and university holidays (Harry playing piano in the bar and me doing the cocktails!) and we appreciate them getting on board for this trip. Situated on the edge of the idyllic Christchurch Harbour in Dorset, England, the hotel is one of five in the Harbour Hotels chain. The others are in Salcombe, Sidmouth, St Ives, and another in Christchurch. David Hurley, Founder of Anglia Computers has also generously donated, again bringing us significantly closer to our target – for which we’re very grateful! Anglia Computers is based in Cambridge, and implements and supports innovative IT solutions based on Microsoft technologies. Anglia Computers won the prestigious ‘Microsoft partner of the year’ award in 2010. We’re still amazed at the generosity of so many people in donating their time, advice, equipment and funds for charity. Let’s hope this extends to the check in desk at Heathrow airport tomorrow so we don’t have to pay too much excess baggage charges! Both our wallets are now a lot lighter, having now booked the flights from London to Natal complete with excess baggage (thanks to Sophie at STA Travel!). We’re heading out on 25th July. Insurance is booked, arms are feeling numb from training (and vaccinations! ), and a lot of very generous people have already donated to Centrepoint, a charity for homeless young people, on our just giving page here. Buggies are on their way from New Zealand (thanks to Craig Hansen and Computer Solutions! ), kites are en route from Vietnam (thanks Ozone! 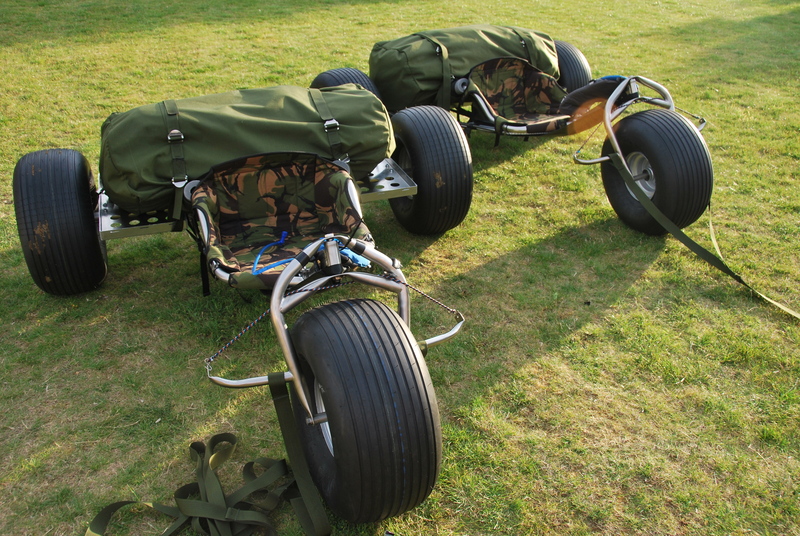 ), buggy bags are currently being stitched in Wales (thanks BuggyBags! ), the best tyre sealant available is already here (thanks Ultraseal! ), and we are the proud owners of four very fashionable caps to keep the sun off in the day and light our way at night from 2C, makers of the Solar Light Cap. We’re planning the whole route on google earth and we really appreciate all the advice and offers for support we have had so far, without which this trip would be even more of a challenge than it already is. If you know the area between Natal and Jericoacoara, we’d love to hear any local knowledge you have. Post your email in the comments below!